As part of the financial results for its fourth quarter, Facebook today announced a number of new milestones. 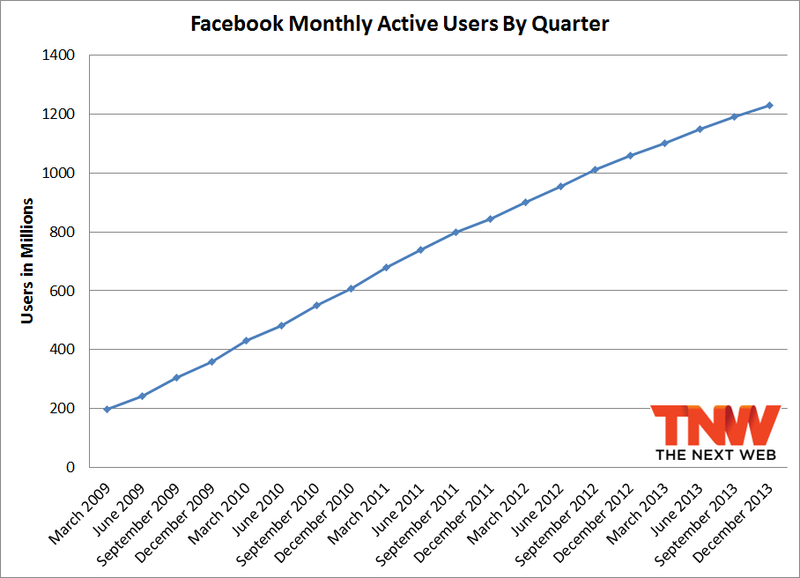 The social network has now passed 1.23 billion monthly active users. Of those, daily active users passed 757 million on average during December 2013, and the number of monthly active mobile users hit 945 million. As always, mobile is what we want to focus on: Facebook needs to keep growing its number of users signing in on phones and tablets to stay relevant and to keep investors happy. In fact, it’s worth noting that 76.83 percent of Facebook’s total monthly user base now accesses the service from a mobile device. 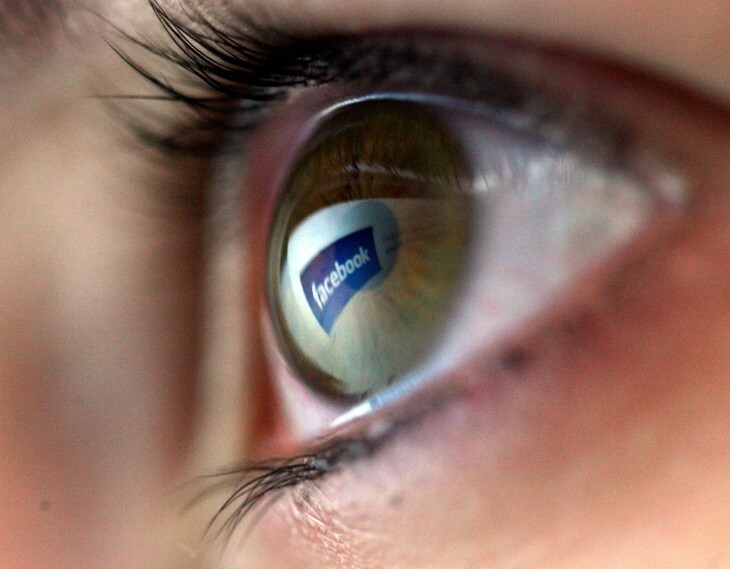 With both daily numbers available now, we can calculate the percentage of Facebook’s total daily user base that accesses the service from a mobile device: 73.44 percent. That number has been slowly growing from the 40 percent mark in 2011, through the 50 percent and 60 percent marks in 2012. It moved into the 70 percent range in 2013 and managed to keep growing. Last quarter, we predicted the number will get to 80 percent in 2014, and while that’s very high for a service that began as a desktop website, we’re sticking to our figure. 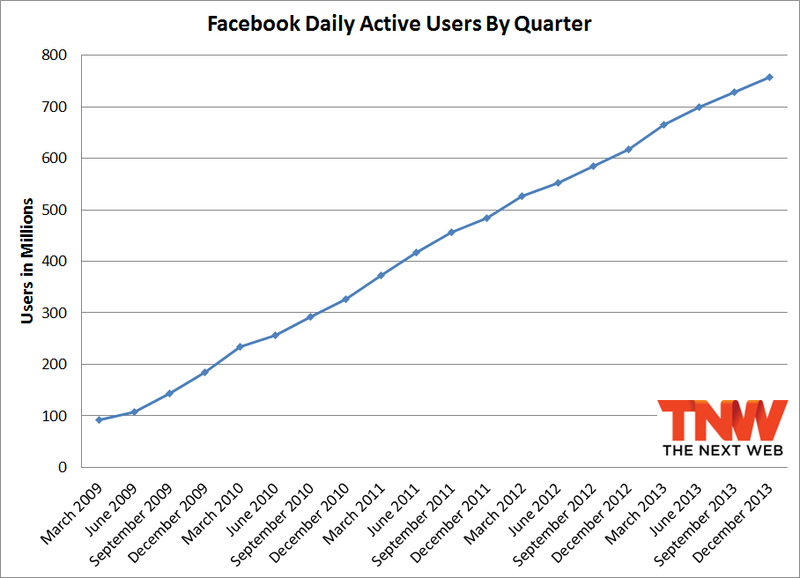 Last quarter, Facebook passed 1.19 billion monthly active users, 874 million mobile users, and 728 million daily users. While the year-over-year growth numbers are listed above, it’s also interesting to see Facebook’s growth from quarter to quarter. Between Q3 2013 and Q4 2013, the company was up 3.36 percent in total monthly users, 8.12 percent in monthly mobile users, and 3.98 percent in daily users. Unfortunately, we can’t look at the growth in daily active mobile users, since Facebook has only started providing the figure this past quarter (that’s why you only see three charts above). 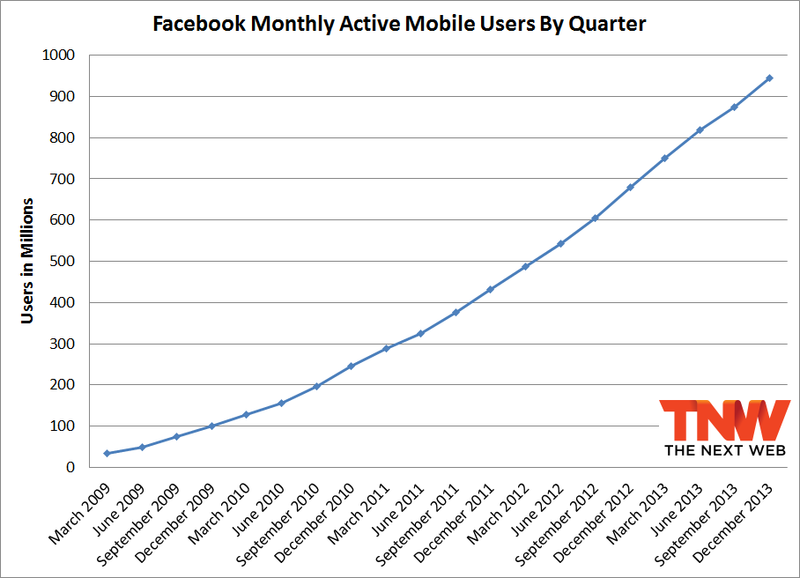 We can say, however, that the percentage growth for monthly mobile users is increasing.